Tiny Toes in SoCal Sand: Post 3 of My Denise Austin Program Series--Week 9! Post 3 of My Denise Austin Program Series--Week 9! I really can't believe that I'm already in Week 9 of Denise Austin's 360 Program. I'm going to share my successes with you so far, and really let you know just how much I have changed in these nine weeks. I want you to understand that I am not "glamorous"in any way, and neither is any aspect of my life. Just look at my deck in the second picture of this post and you will see. I'm busy. I don't have the ease of a big exercise studio or even more than five feet to myself to work out. 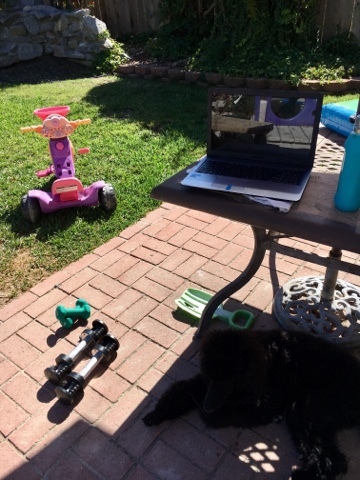 This is often where I work out: In my backyard watching Denise on the computer with my dog right in front of me. 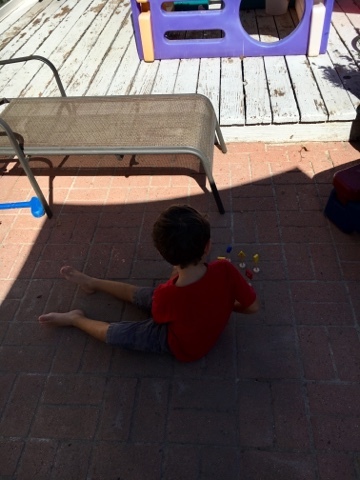 And my four year-old son three feet behind me, playing with his cars. It really drives me insane that everyone feels this need to be three feet away from me at all times while I work out, but I'm told that I will miss this someday, so I try to cherish it! Nine weeks ago I embarked upon this journey with Denise's program, and I was in a sad place. I struggle with depression, and I'm trying to not be so embarrassed to discuss this more. It's necessary for people to see that they are not alone. Nine weeks ago I was feeling heavy from a twenty pound weight gain and I literally could not get my eating or my feelings under control. I knew that I had to fight and I decided to use Denise as part of my battle plan to get myself out of the mud pit. My decision was not easily made. I have tried a million diets and exercise plans. I have failed miserably most of the time in both of these areas. My twenties were spent trying so many different plans and failing at every single one. 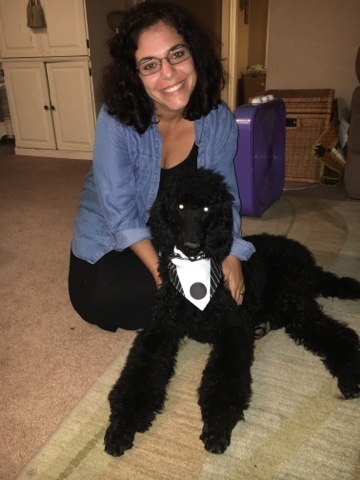 I finally found success at age thirty-three and lost fifty pounds, but I unfortunately gained it back after two pregnancies and a child with special needs. I lost sixty-five again and kept it off until May of this year--the month where I lost control of my healthy habits and could not get my footing no matter what I tried. 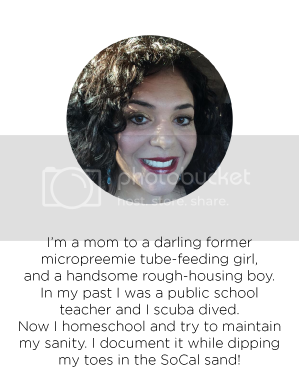 I had turned forty in April and was in the best shape of my adult life, and then it all fell apart due to not putting my needs in front of other's wants. I think this is a common life theme for many of us. Have you ever felt like no matter what you do, you cannot gain control of your eating?? And every day you "start" your "new life/new plan" and by dinner you simply cannot control it any more and you find yourself going WAY over your calories? And then you try to work out but find every excuse in the world to push it until "tomorrow?" For those of us who struggle with emotional eating, perhaps the hardest part is sticking to it. For the past few years I have lived a very healthy lifestyle with whole foods and exercise and then it was gone, and it was scary. People who have lost large amounts of weight and gain some back know just how scary it is. My twenty pound gain terrified me because I knew that in a few months I would easily gain back my sixty-five pounds. So I made checklists and prayed and talked my husband's ear off about which program I should try to get myself back in control. Choosing Denise's program was what put me back in the right mindset--the mindset to stick this out and FIGHT. I'm fighting my way back into my jeans that fit me in May and I'm almost there! -Every night I FIGHT the urge to eat eat eat eat but it is getting infinitely easier. It has taken many weeks to get to this place, but it is so much easier. -Every morning I get up and immediately put on my workout clothes and look forward to my exercise date with Denise. - I smile when I'm doing the videos and I feel my muscles working. I'm in Week 9 and I'm starting to see the "old me" emerge. I see muscle definition and I even flexed in the mirror today! -I ate two persimmons yesterday even though they are higher in calories. Why did I eat them? Because they are healthy and because I want to be healthy. I'm gravitating towards healthy food now and starting to crave it. -I'm almost in my old jeans that I wore in May! I put them on every week and today was the first day that I could probably get away with wearing them again (I'm not going to because I really like the jeans and I don't want them to rip, but I have a feeling that I will easily be wearing them in a month's time). It is amazing. 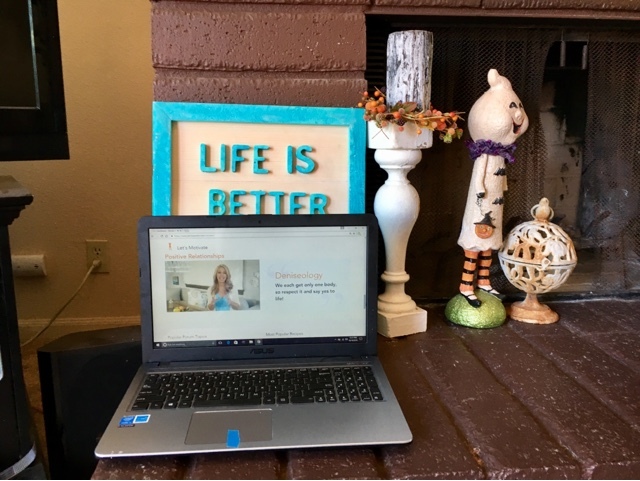 -I have more energy, and I'm even taking the kids and my new puppy on a thirty minute walk daily because I crave the exercise. Three months ago I had to force myself to get in my friend's pool and move my body just a little bit. -My depression has lifted. Exercise and healthy eating are an integral part of the treatment for depression. Denise was the perfect person to stand with me in this battle. My smile here is real. (The purple box fan in the background once again demonstrates just how unglamorous I am). I am in no way going to pretend that this is the last battle that I will ever fight regarding my weight and my health habits. I believe that it is going to be a lifelong struggle and that some times will be easy and some times will be dreadfully difficult. I'm so thankful that I have this battle under control. Finally. I wanted to leave you with a picture of the motivational video that Denise had for me last week. Her short videos are a treat to look forward to. I just love them. 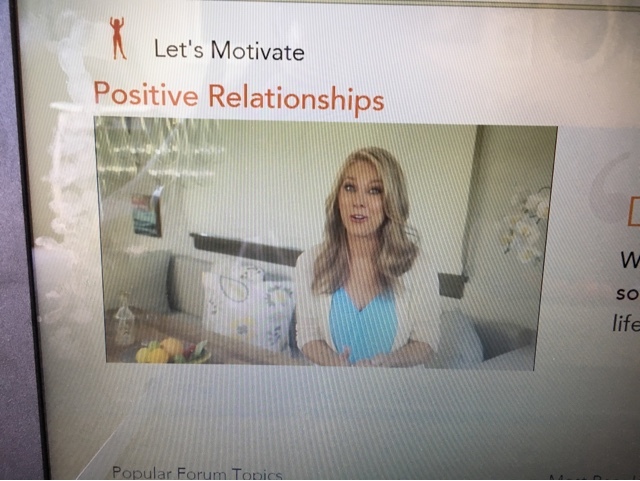 In my next post in my Denise Austin series, I'll share the exact reasons why this program has worked so amazingly well for me. **You can find my first blog post on this program here. **You can find my second blog post on this program here. **You can find my fourth blog post on this program here. I was compensated for this blog post but it in no way affected how I viewed the program or wrote about it. It is my honest opinion.